Enclosed cabs are a primary means of reducing the silica dust exposure of equipment operators at surface mines. The National Institute for Occupational Safety and Health experimentally investigated various factor effects on cab air filtration system performance. 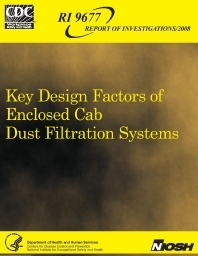 The factors investigated were intake filter efficiency, intake air leakage, intake filter loading (filter flow resistance), recirculation filter use, and wind effects on cab particulate penetration. Adding an intake pressurizer fan to the filtration system was also investigated. Results indicate that intake filter efficiency and recirculation filter use were the two most influential factors on cab penetration performance. Use of the recirculation filter reduced cab penetration by usually an order of magnitude over the intake air filter alone because of the multiplicative filtration of the cab interior air. Intake air leakage and filter loading affected the cab penetration to a lesser extent, while wind had the least impact on cab penetration between the calm and 10-mph wind velocities tested. Adding an intake pressurizer fan notably increased intake airflow and cab pressure with only minor changes to cab penetration. A mathematical model was developed that describes cab penetration in terms of intake filter efficiency, intake air quantity, intake air leakage, recirculation filter efficiency, recirculation filter quantity, and wind penetration.